Life among Christians can be great. But it can also be exasperating The joys of fellowship in Christ too often give way to division and debate. You may find yourself drawn into arguments over such things as the correct form of worship or the proper role of charismatic gifts. Perhaps you wonder, Why don't we get along together as we should? Or How can we recapture the unity of the early church? 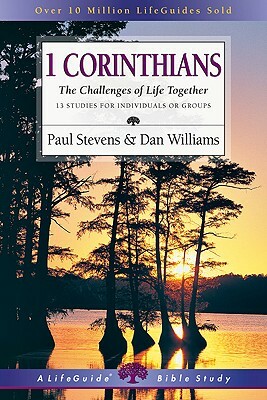 Surprisingly, the first Christian believers didn't always live in harmony either As Paul Stevens and Dan Williams lead you through this study of 1 Corinthians, you will see that the issues facing the Corinthian church are little different from the ones your church struggles with year after year. Here in 1 Corinthians is a portrait of Christian community not as it was meant to be, but as it often really is. But here too is practical advice for overcoming the challenges of life together. Now available in IVP's revised LifeGuide Bible Study format, 1 Corinthians features questions for starting group discussions and for personal reflection, as well as a new "Now or Later" section following each session.